Earlier this month, many political offices across the country changed hands as a result of the November 2018 elections. 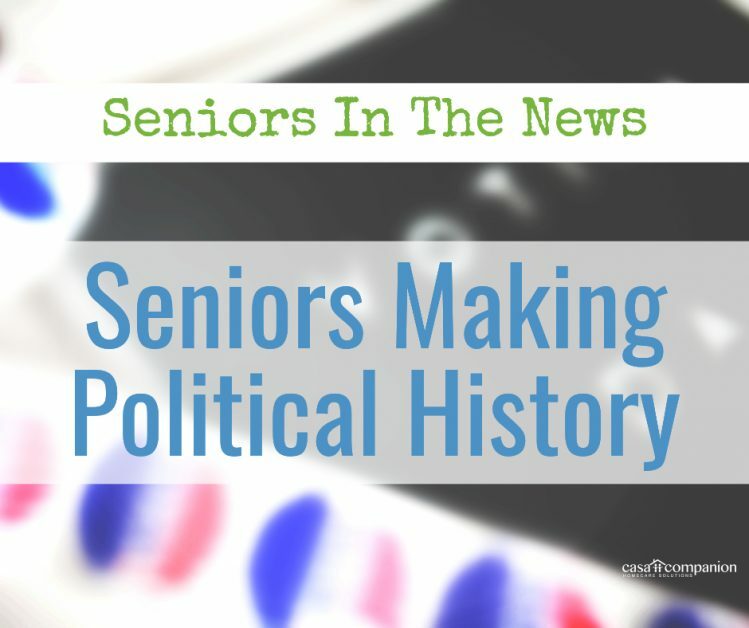 Politicians, unlike many seniors in other professions, don’t face a mandatory retirement age. So there are many serving Congresspeople who are over 65. Still, among so many seniors in public service, we found three who are breaking barriers, setting records and making history. Caregivers, home care aides and loved ones will enjoy these stories of three California public servants making history on the local, state and national level! When 80-year-old Mike Schaefer was sworn in to his new position as a member of the California Board of Equalization last month, he became the oldest elected official in the state. He won his first and only other election in 1965, when he was elected to the San Diego City Council. In between, he’s lived a full and sometimes scandalous life, featuring scandal, convictions, court-ordered restitutions, and disbarments. He even changed political affiliations in 2003. On the plus side, he brought lawsuits against the state that has positively changed our state’s election processes. Fun fact: the Superior Court Judge who swore him in, David Gill, is San Diego’s longest serving judge, a fellow octogenarian at age 85, and a law school classmate! Schaefer is looking forward to serving San Diego, Imperial, Orange and Riverside counties and some of San Bernardino County, despite having received not a single campaign donation from the public. The day before 80-year-old Governor Jerry Brown handed the state of California over to newly-elected Governor Gavin Newsom on January 7, 2019, he was the country’s oldest governor. Governor Brown was California’s 34th and its 39th governor, because he served two terms from 1975 to 1983, and two more terms from 2011 to 2019. He was California’s youngest governor after his first election, and the state’s oldest governor after his third election. He served as the state’s Attorney General, the Secretary of State, and as the Mayor of Oakland. In between, he ran unsuccessfully for both Senator and President. After a life of public service and nearly non-stop elections, the former governor is retiring to Colusa County in northern California. But will he rusticate? He’s already said that he plans to stay involved with California and its issues. It’s very unlikely that this is the last chapter for this octogenarian. Representative Nancy Pelosi, who has served her San Francisco district in the House of Representatives since 1987, has won 16 straight elections. In the last three decades, she’s broken a few records previously held by men. According to her party, she is their all-time top fundraiser, helping to raise money for first-time and repeat candidates all across the country. In 2007, she became the first female Speaker of the House in American history. She was also the first Italian-American to hold that position, and the first Californian! In 2011, she lost her position as Speaker when the House changed hands. However, on January 3, 2019, at age 78, she made history again when she was re-elected Speaker of the House. She’s one of seven Speakers who have served non-consecutive terms – but the only woman. That makes her the highest-ranking elected woman in American political history – twice.